10% of their annual income, experience significant pain, and pay out-of-pocket expenses for travel, housing, and child care. Prolonged recuperative time, pain, and cosmetic results are, therefore, disincentives to traditional live kidney donation. Thus, the laparoscopic living donor nephrectomy was specifically designed to address the significant financial and logistical disincentives to open live kidney donation. Preoperative evaluation ensures that the potential donor is left with normal renal function after unilateral donor nephrectomy. All potential donors undergo extensive medical and psychological evaluation in accordance with guidelines published by the American Society of Transplantation. A very useful test for preoperative radiologic evaluation of living donors is dual-phase spiral computerized tomography (CT) scan with three-dimensional angiography. The operative procedure for the laparoscopic live donor nephrectomy has been described previously in detail. A left nephrectomy is described here. After induction of general anesthesia and preoperative antibiotic, a Foley catheter and an orogastric tube are placed. The patient is placed in the modified flank position with the torso in a 45° lateral decubitus position and secured to the table. The hips are rolled slightly posterior to allow exposure to the lower abdominal midline. The arms are flexed and placed at chest level with appropriate axillary and lower extremity padding. The table is then flexed. 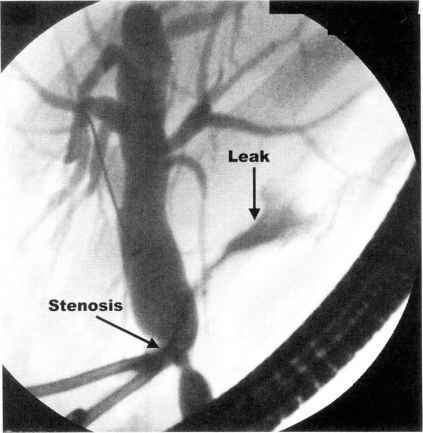 Pneumoperitoneum up to 15 mmHg is established using a Veress needle in the subcostal region. 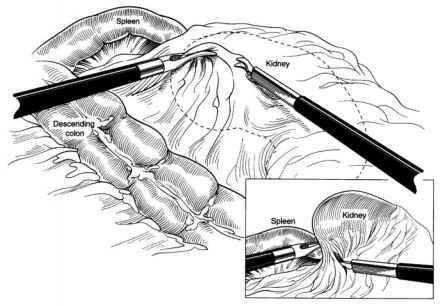 Three transperitoneal laparoscopic ports are placed, as depicted in Figure 9.2a. The first 10/12-mm port is placed lateral to the rectus muscle, halfway between the umbilicus and iliac crest using an optical trocar (Visiport RPF optical trocar, U.S. Surgical Corp., Norwalk, CT). The second 10/12-mm port is placed at the umbilicus and a 5-mm port in the midline between the umbilicus and xiphoid, both under direct vision. The umbilical port is used primarily as a camera port throughout the dissection. A 30° lens is used for visualization during the procedure. The AESOP 1000 robotic arm is employed (Computer Motion Inc., Goleta, CA) to hold and direct the laparoscope during the procedure. During the operation, the patient's fluid volume is kept expanded to maintain renal blood flow and good urine output. Patients are routinely given in excess of 5-7 L crystalloid intravenously, in addition to diuretics. Figure 9.2a. Laparoscopic donor left nephrectomy patient position. The three port placements (10/12 mm. 5 mm, 10/12 mm) are noted. The fourth port is placed in the midline through a short Pfannenstiel 5 cm in length. completely. Extreme care is used to avoid thermal injury to intra-abdominal viscera when using the electrocautery. The lienorenal and lienocolic ligaments at the inferior border of the spleen are divided, allowing the spleen to be retracted superiorly. The posterior attachments to the spleen may also need to be divided to mobilize the spleen and splenic flexure medially. The renocolic ligaments are divided and Gerota's fascia exposed. 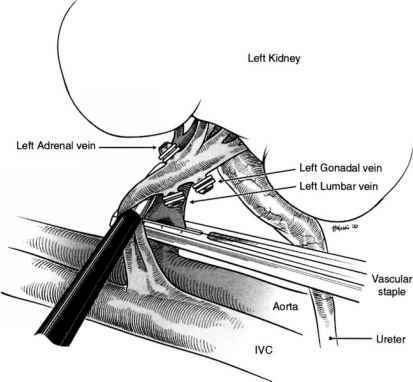 The upper pole of the kidney is then completely freed within Gerota's fascia. Dissection is facilitated with gentle elevation of the upper pole with a blunt retractor (Fig. 9.2b). Figure 9.2d. Division of left renal artery and vein sequentially. ureter is then transected at the level of the left iliac vessels after double ligation with a 10-mm clip applier. The remaining inferior, lateral, and posterior renal and ureteral attachments are finally divided with sharp and blunt dissections. A 5-cm Pfannenstiel incision is made at this time, and a 15-mm Endocatch bag (U.S. Surgical Corp.) is inserted while maintaining pneumoperitoneum with a circumferential suture ligature. This instrument can be used to assist in retraction of the colon medially if inserted earlier in the operation. The patient is then given 3,000 units of heparin, and the renal artery and vein are then transected individually and sequentially with an endovascular GIA stapler (Autosuture, U.S. Surgical Corp.) (Fig. 9.2d). 500 ml iced preservation solution after its delivery. Protamine sulfate (30 mg) is given intravenously and the abdominal fascia are closed with interrupted No. 1 absorbable sutures. The renal bed followed by the trocar sites is inspected for hemostasis. The fascia of the 12-mm trocar ports are closed with No. 1 absorbable suture. For right-sided laparoscopic donor nephrectomy, the operation is technically more difficult, because the liver must be retracted cephalad to allow dissection of the upper pole. The midline port between the xiphoid and umbilicus is placed more superiorly. A blunt instrument is required to retract the undersurface of the liver to the right sidewall. Exposure of the short right renal vein at the level of the vena cava is accomplished after the duodenum is kocherized. To remove the kidney, a 6- to 8-cm right-upper-quadrant transverse incision is made. This incision is made when the entire kidney has been mobilized and the ureter divided. 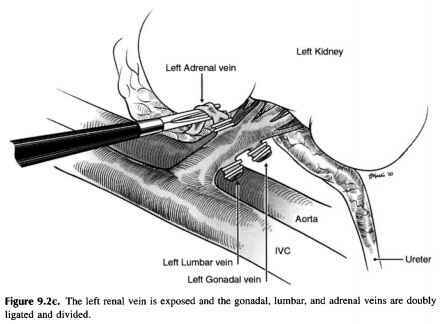 The renal artery is ligated proximally and divided, and the right renal vein is divided after placement of a Satinsky clamp across the IVC to allow maximal length of the renal vessel. The vena cava can be closed with 4-0 Prolene or the VCS clip applier (U.S. Surgical Corp.).